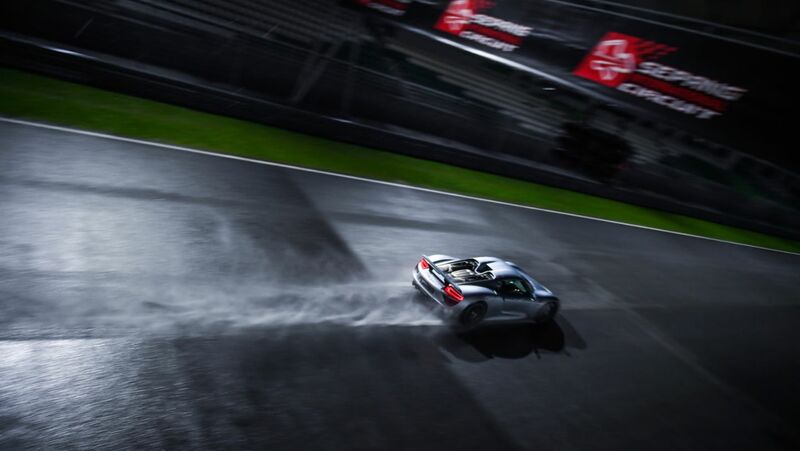 Porsche Asia Pacific is staging the region’s first-ever E-Performance Nights event in Malaysia, which will kick-off with a Road Tour of the beautiful Kuala Lumpur city skyline at eventide, followed by a one-of-a-kind racetrack experience at Porsche Experience Centre (PEC) Sepang. The pioneering event showcased the brand’s top echelon of Porsche plug-in hybrid models, such as the 887 bhp 918 Spyder and 680 bhp Panamera Turbo S E-Hybrid (500 kW; Fuel consumption combined 2.9 l/100 km; CO2 emissions 66 g/km; electricity consumption (combined) 16.2 kWh/100 km), on the racetrack after dark – giving a taste of Le Mans style driving. The Cayenne E-Hybrid, which makes its first debut in Asia Pacific at the event, will also be driven for the first time by media in the region. Furthermore, a scale model of the Mission E, now christened Taycan, was on display together with an integrated Augmented Reality (AR) experience that previews the brand’s future all-electric vehicle. “E-Performance is a core tenet of our future strategy. In 2025, we envision that around half of the new cars we sell will be electrically-powered Porsche models, whether fully-electric or hybrids. The E-Performance Nights event is the perfect way for us to demonstrate our plug-in hybrid models that embody the Porsche DNA, whether it is urban driving in Kuala Lumpur or driving on the racetrack at Sepang. Our Taycan will encapsulate all of this and more – stay tuned,” said Arthur Willmann, Managing Director of Porsche Asia Pacific. Porsche was the first manufacturer in the premium segment to offer plug-in hybrid systems in three different model lines. Today, the Panamera and Cayenne plug-in hybrid models are part of the company’s strategy to offer efficient vehicles that are also everyday sports cars. This paves the way for the launch of the Taycan, the company’s first purely electric car, in 2019. Of the models taking centre stage at Sepang International Circuit, the 680 bhp Panamera Turbo S E-Hybrid (also its Sport Turismo derivative oniste) displays best-in-class performance in comfort and sport with its 4.0-litre bi-turbo V8 and electric motor with a 14-kWh battery. Bearing Porsche’s iconic design DNA, it features typical Porsche driving dynamics combined with maximum efficiency, as well as the boost strategy which originated from the 918 Spyder. The Cayenne E-Hybrid, meanwhile, combines Sports Utility with a new performance-oriented hybrid strategy that heightens emotionality, while maintaining its day-to-day usability and off-road capabilities. It delivers 462 bhp and 700 Nm from a 3.0-litre bi-turbo V6 and electric motor with a 14.1-kWh battery, through an 8-speed Tiptronic S gearbox (340 kW; Fuel consumption combined 3.4 – 3.2 l/100 km; CO2 emissions 78 – 72 g/km; electricity consumption (combined) 20.9 – 20.6 kWh/100 km). Both plug-in hybrid models are perfect illustrations of Porsche’s commitment to E-Performance. Porsche Asia Pacific Pte Ltd, a subsidiary of Dr. Ing. h.c. F. Porsche AG, commenced operations on 1 October 2001 and currently oversees 12 countries from its headquarters in Singapore. Offering support to its importers and dealers in After Sales, Business Development, Marketing, Public Relations and Sales, Porsche Asia Pacific manages the following countries in the region: Brunei, Cambodia, French Polynesia, Indonesia, Malaysia, Mongolia, New Caledonia, the Philippines, Singapore, Sri Lanka, Thailand and Vietnam. In 2017, the Porsche Asia Pacific region delivered 5,390 vehicles of its 911, Cayenne, Macan, Panamera, 718 Boxster and 718 Cayman to its customers. In March 2018, Porsche Taiwan Motors Pte Ltd was inaugurated as a new subsidiary in Taiwan, by forming a joint-venture with its long-time business partner, Universal Motor Traders (UMT). The Panamera Turbo S E-Hybrid Sport Turismo is showcasing the potential of hybrid technology.